When alpine or ice climbing, one of the biggest issues I face is finding an appropriately fitting jacket. There are three questions I ask myself when selecting the right jacket for the right job. First, will the jacket fit easily under a harness? Can I raise my arms without the cuffs of the jacket falling below my wrists and without the jacket pulling out of my waistbelt? Finally, is the jacket moving with me or against me? With the advent of softshell technology and virtually every manufacturer making a softshell jacket, one is faced with a myriad of choices. I have had the pleasure of wearing many softshell jackets from a variety of manufacturers and I can surely say that the Marmot Kingpin jacket is my favorite. I have spent at least 20 days in this product and it has performed above and beyond my expectations. The Kingpin stretches with me while I reach my tools for the distant ice thanks to the Marmot M1 softshell material. This particular piece is cut just a bit longer than most softshells keeping it from pulling out of the waistbelt of my harness when swinging above my head. There are two handwarmer pockets strategically placed on the chest so you can put your warm gloves on at the belay without interfering with your harness. Two drawstring closures allow cinching the jacket tight around your waist to ward off the wind on those gusty Longs Peak days along with the Polartec Wind Bloc membrane laminated directly to the softshell. I find it also quite useful that the hood can easily fit over my helmet when I’m out in less than ideal conditions. I wear a large in this garment and it seems to be slightly bulky in the chest and stomach. The medium was a bit too short in the waist and arms. 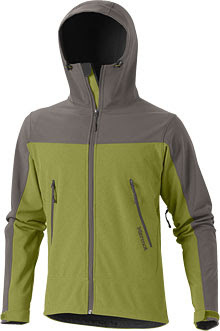 Aside from the slight sizing discrepancy, this jacket is now a "go to" in my arsenal of alpine climbing accoutrements. Did I mention it’s stylish too?